So, I think my fears are entirely reasonable … though honestly, with 150+ people there each August, I’m sure this guy and his relatives take a quick vacation. This entry was posted in Snakes, Tri-State Fellowship. Bookmark the permalink. Remember last year during the baptism, folks saw a much smaller version in the water, and didn’t tell you util it was over? Aargh!!! Oh boy… I never heard that story! Probably, as you know, I’m a total whacko. It is amazing that I get the same color socks on every day. I can’t remember if Genesis or Revelation is first or last. I think my wife’s name is Diane or Diana or something like that. All these problems started when I turned age 65 … I think. I only remember happy things … like my stuffed toy monkey named “Teddy” back when I was a kid in the 1930s… his head fell off … OH NO, a sad memory has breached my selective wall!!! … “we’ve got no food … our pets heads are falling off!” … is why I’m thinking of going somewhere: “I’ll tell you where. Someplace warm. A place where the beer flows like wine. Where beautiful women instinctively flock like the salmon of Capistrano. I’m talking about a little place called Aspen.” …………. 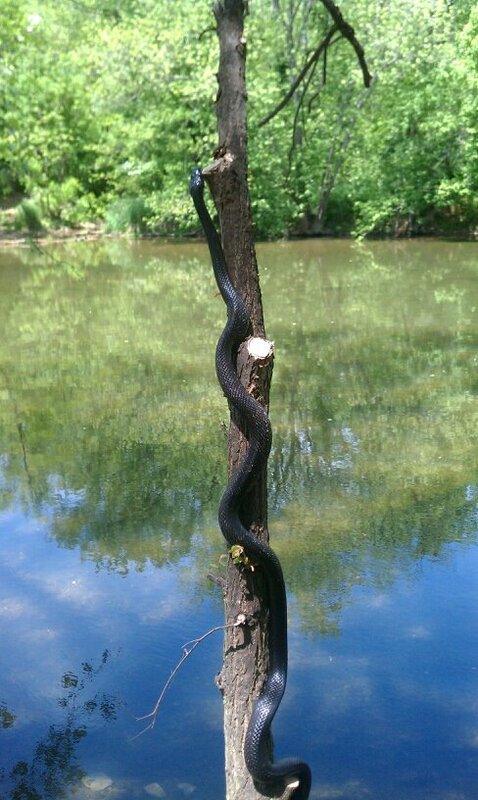 oh woe is me … all started by a little snake in a 2nd rate country stream in a nondescript corner of PA.
65? I thought you just turned 57 !!! AND you are not a complete whacko !! I mentioned once – remember something about a dual P.? Tell me, what other happy things do you remember besides that silly (sorry) monkey? You said you received a lot of good comments – well most of them – about your combo family situation. I guess mine was NOT a good one? Old ladies like to assist where they can. This one should keep her mouth (or typing fingers) shutor to herself? Your thoughts?